Well, not quite, but at least the weather is quite a bit warmer than it has been lately, with a high today of around 51 or 52 and very little wind–much nicer. Over the Lunar New Year holiday, I just hunkered down in my warm apartment, only going out for a few groceries. So, I spent the four days since Saturday downloading and watching all of season 4 of the TV series “Lost” because one of my students started talking about it and saying how much she liked it. I hadn’t watched it for a couple of years, but that changed during my time off. I also downloaded the most recent two episodes of “Battlestar Galactica,” my other favorite TV series. You can watch it on the Sci-Fi channel, which we don’t get here. I see that the Yanks re-signed lefty Andy Pettitte to a new contract. That really shores up the pitching staff and I’m sure World Series dreams are floating around inside every Yankee fan’s head–I know I’m having that dream. More later. I mentioned in one of my prior posts that it was supposed to turn colder this weekend, and it has. Now, if you live in Montana where the temperature has dropped to below zero (Fahrenheit), you probably don’t have a lot of sympathy for our low 20s temperatures. However, that’s not the problem. The problem is the almost never-ceasing wind that’s howling outside my window. It occasionally gusts to 35mph, dropping the wind-chill down to near or below zero. At least it’s not snowing (fingers crossed). I think I’ll spend the next few days hibernating in my apartment. I’m off until Wednesday, however, due to the Lunar New Year, which Korea celebrates along with China and a few other countries. The actual holiday is on Monday, but the days before and after are part of the holiday, so we have a four-day weekend. So long to the Year of the Rat and hello to the Year of the Ox. 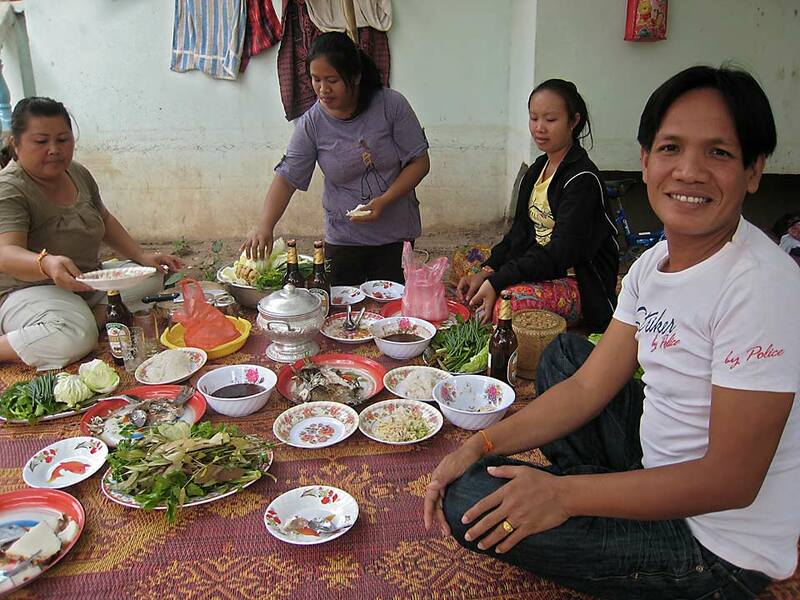 I’ve been posting a lot of photos of my recent trip to Laos and Thailand, and this is going to be the last one. 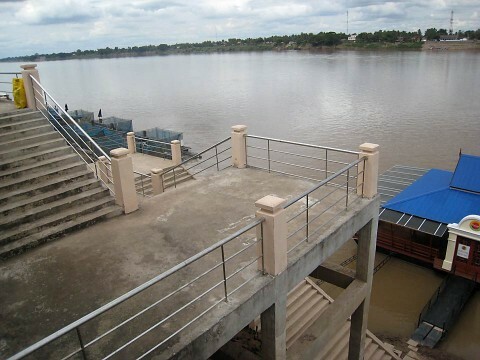 It’s a photo of one of the docks along the Mekong River in Nong Khai, Thailand. If you refer back to a shot I took during the flood last August, you can see just how high the river was. See that photo here or look in the Archives for August 14, 2008. I’ve also added a new gallery to the Photo Gallery, Laos Dec 08, so you can click here to see some more photos of the trip, including some of yours truly, that I’ve put up there. Enjoy. More later. Nai and I went to Vang Vieng, one of our favorite areas, for a few days around Christmas time and, in fact, spent Christmas Eve and Day there. The village was lit with a few holiday lights and fake Christmas trees, but nothing spectacular. The most notable sign that it was a holiday were the hordes of drunk, loud and sometimes obnoxious younger backpacker-type tourists celebrating the season. 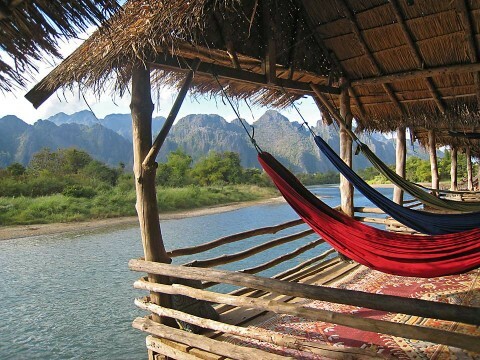 Like I stated earlier, this time of year is the peak of tourist season, and if I’m ever back in Laos in December, I’m going to avoid Vang Vieng. Despite the crowds, we still had a decent time, relaxing along the river for the most part. Here are my favorite “Christmas” decorations (and any other time of year for that matter) along the Song River. 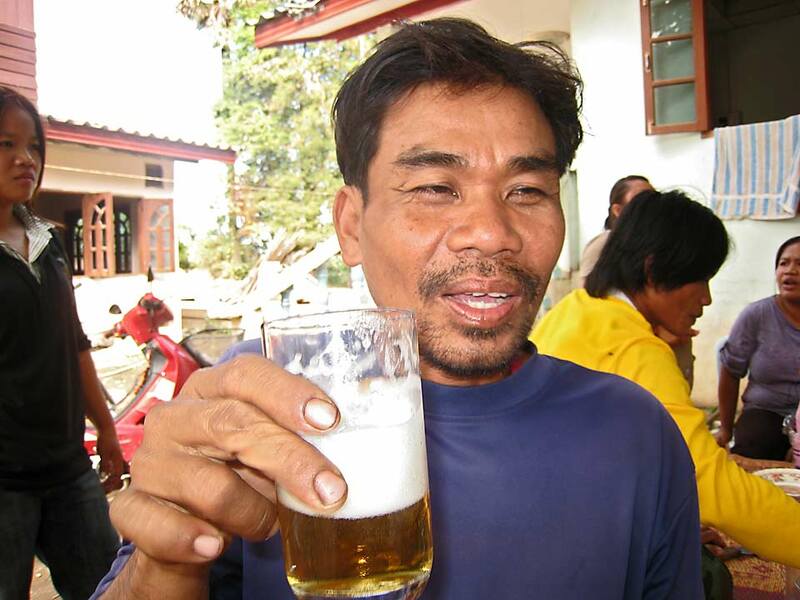 Of course, not everyone was partying and getting smashed on Beer Lao. 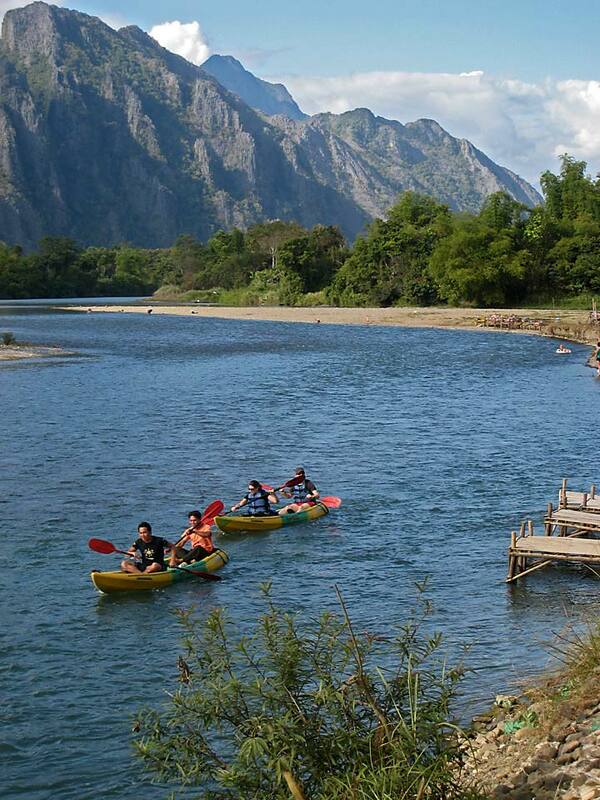 Quite a few people took advantage of the great weather, kayaking and tubing down the river, a popular pastime here. 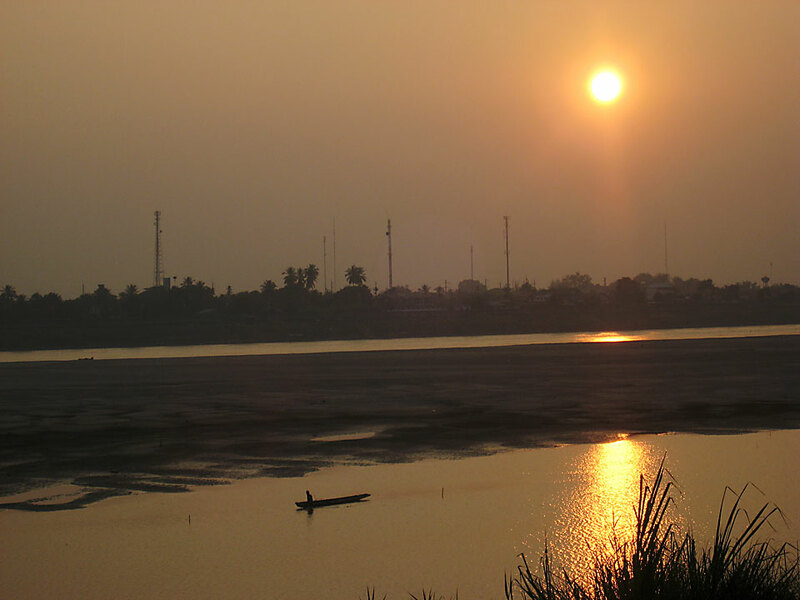 So, after a hard day of “hammocking” (as opposed to kayaking) along the river, it was time to go back to our room at the Riverview Guesthouse and sit on our balcony to watch the sun go down. Here’s another view from the balcony, looking over some newly built river side guesthouse bungalows towards the surrounding mountains. New bungalows had also been built across the river, reached by crossing a footbridge. 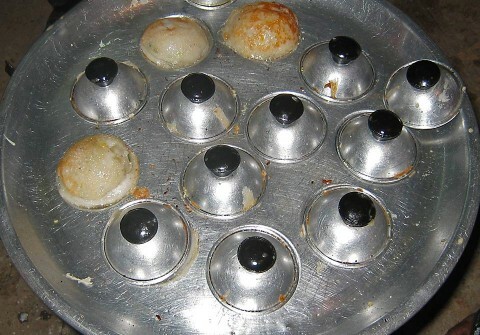 One of the highlights of the trip was my introduction to a fantastic Lao dessert (name unknown). 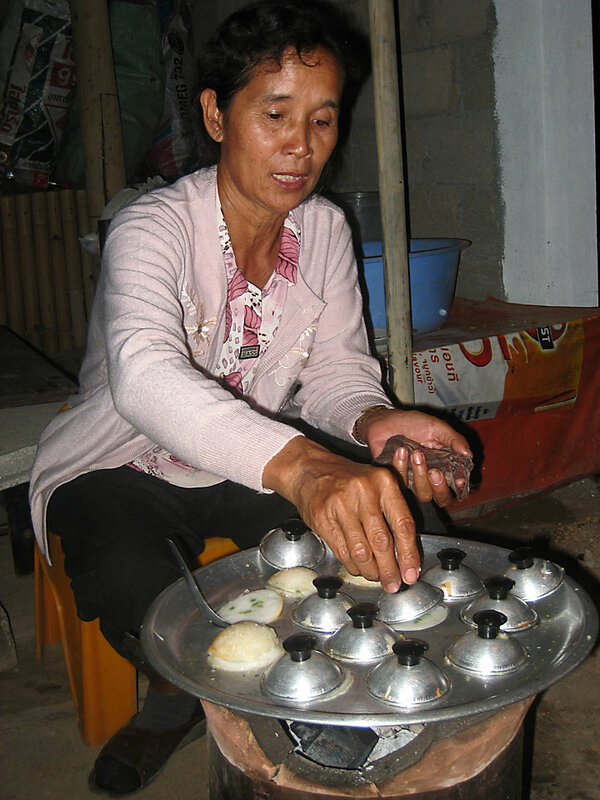 Made with coconut and cream, these were cooked over an open fire in small, covered containers. Eaten fresh and hot from the fire, these were delicious! 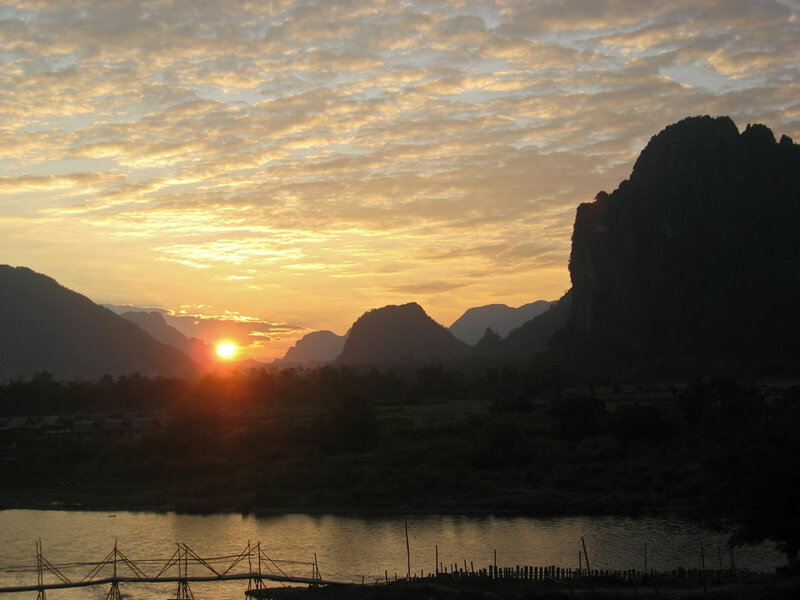 After spending four days in Vang Vieng, it was time to go back to Vientiane and sit along the Mekong and watch the sun go down. Vientiane actually seemed more peaceful than Vang Vieng. Notice how low the river is compared to the photos of it I took last August. So, all in all, it was a nice visit to Laos, as usual. I’ll post some more photos to the Photo Gallery eventually, so keep checking in. More later. I was going to post what Christmas in Vang Vieng was like, but I’m caught up in watching the Inaugural Parade in Washington, D.C. before I have to go to work. No, I didn’t watch the oath-taking ceremony–it was about 2 a.m. our time when that event took place. It looks pretty cold in D.C., colder than here, but we’re expecting rain later this morning and colder temperatures this weekend. Sheeesh, I miss the tropics! More later. Wow, looking back at my archives, it appears that this is the longest time I have gone between posts; I’ll definitely try to be more diligent in the future. Obviously, I’m back in Yeosu, suffering through the Korean winter. Located high on a hill, the university gets more than its share of wind, and when the temperature drops below freezing, it feels more like zero (fahrenheit). It reminds me very much of Montana winters, sans the snow. 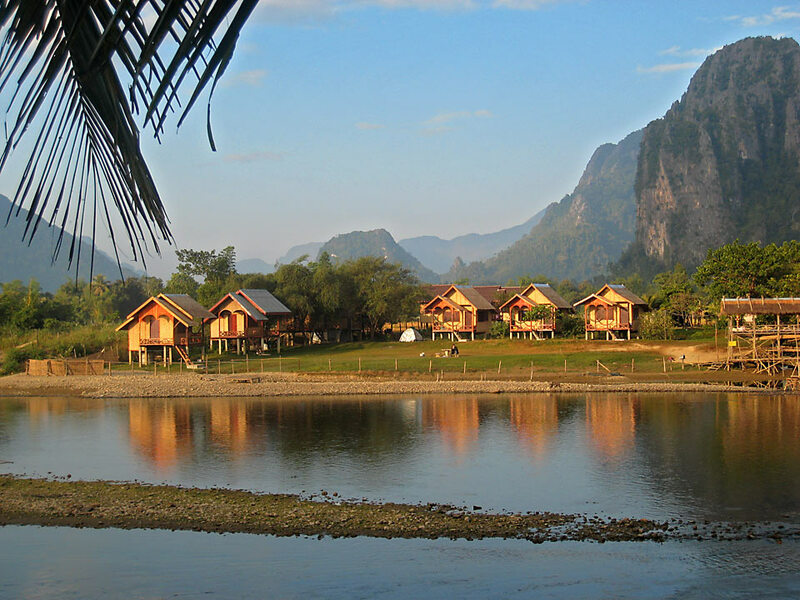 I wish I were back in Laos again, where, for the most part, the weather was perfect–sunny days and mild nights, with temperatures in the 80s and mostly low humidity. I’d never been in Laos this time of year and I was surprised at the number of other tourists visiting the country. 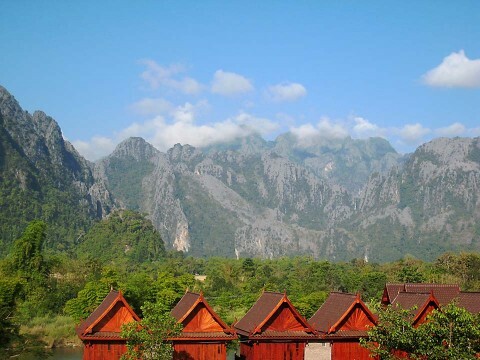 It’s high season during December, January and February, and Vientiane and Vang Vieng were packed, relatively speaking. 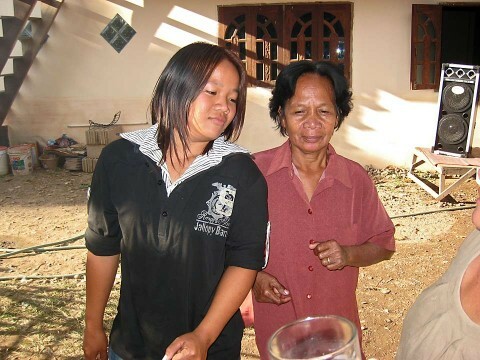 I made a quick trip into Nong Khai, Thailand, and coming back through Laos immigration took around and hour, much longer than it normally takes. I’ll write more about the trip in later posts. I’ve been going through the pictures I took while I was on vacation, trying to decide which ones to post here. This first group will be food related, for no particular reason than that they seemed to stand out more than the others. 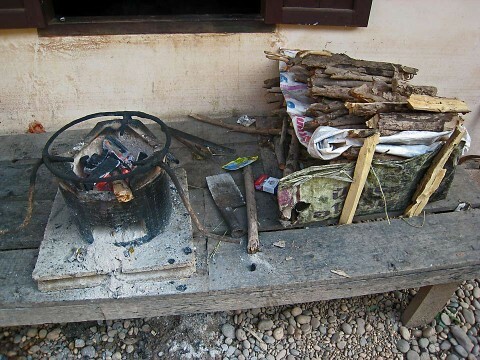 Many Lao people still cook in the traditional way, over an open fire, mainly because they can’t afford a gas or propane stove. The smell of burning wood brings back memories of many Montana campfires. Here’s the main “stove” at Nai’s family’s house. 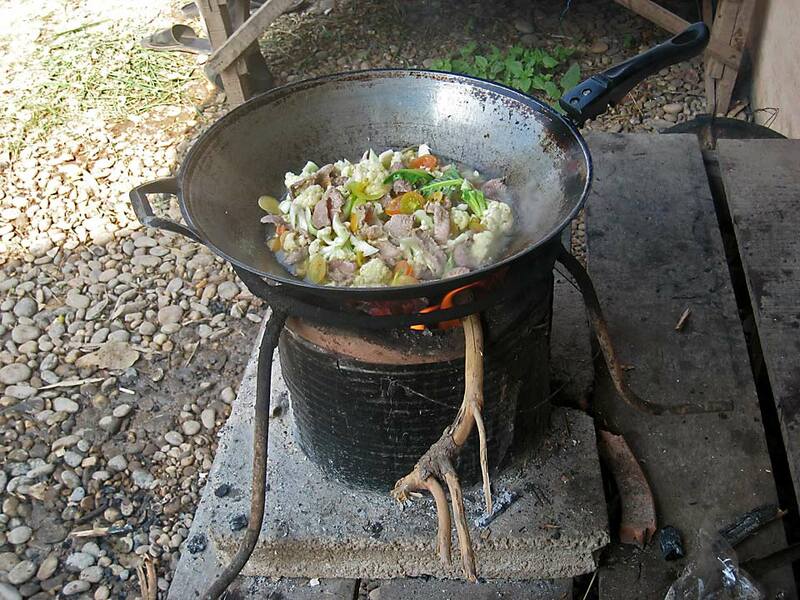 Yep, a one-burner fire. 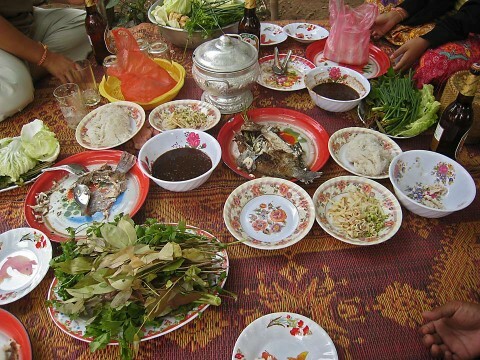 Almost all the cooked food is prepared here, the day’s rice, fish, meat, chicken and whatever. Below are the simmering ingredients for “noodle soup chicken,” as Nai calls it. When the veggies and chicken are done, you add some water and precooked noodles, simmer for a while, and eat. So, what is my favorite Lao food? I’m glad you asked. 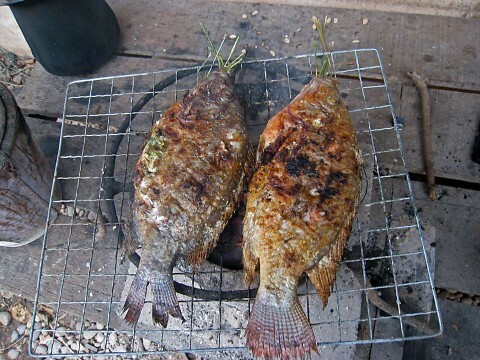 It’s just plain ol’ fish, barbecue style, stuffed with lemon grass (I think), fresh from the Mekong. I could eat these beauties all day long. Ok, since I’m writing this early on Monday morning, I find that I’m running out of time and I must go to work soon. Check back tomorrow for more on Lao food. P.S. As promised, I posted a photo of the Hanoi Noi Bai airport restaurant on the previous entry.